With a friend joining me, I dive Troy Springs in the middle of the Suwannee River springtime, and in the middle of the worst drought in Florida history. The run from the spring to the Suwannee is only a couple of hundred feet long, and is 4 to 6 feet in depth. 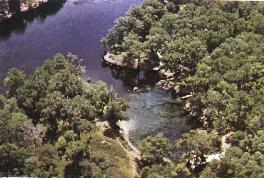 The legend of Troy Springs is that there is an old Suwannee River paddle-wheeler steamboat wreck called Madison. She was scuttled in September 1863 by her captain, James M. Tucker, who abandoned his vessel in order to lead a band of men to fight for the Confederate forces in Virginia in the Civil War. Unfortunately, I had thought the wreck was at the bottom of the spring. We did not find it, because it is apparently near the Suwannee River at the end of the Spring run. Word has it that the wreck has had it's wooden planks looted over time by souvenir seekers. We gear up and dive, dive, dive. Lots of turtles. The bottom of the spring chimney is about 70 feet. At about 20 feet, we look down and see only an inky black. Can't see what we are descending to, but we press on. Near the bottom, our eyes adjust to the light. At the bottom, the chimney is impressive. Tall, sheer limestone walls circle above us -- Cathedral-like. I recline against a rock, fold my arms, and peacefully gaze up at this magnificent, clear-water view around me for several minutes. An impressive, large spring. Many have died in the Troy cave in the past. We don't enter the large cavern entrance. Too dark and I do not have my light.